The Xdirect is a high quality interface that lets you connect instrument, line, or speaker level signals to a mixer or other balanced input. The high impedance single-ended 1/4" and XLR inputs are buffered and converted, by very low noise active electronics, into an isolated balanced low impedance signal source. The Xdirect has an extremely flat and wide frequency response and can handle high signal levels while still maintaining an isolated balanced low impedance output. This gives the Xdirect a very clean and neutral sound with a wide variety of signal sources and over long signal runs in high noise environments. The Input Attenuator switches allow for a wide range of signal levels and the Input Link jack allows for tapping off of your signal chain. The Ground Lift switch lets you totally separate the input and output signal grounds, when appropriate, to isolate two systems, thereby reducing hum and ground-loop noise. What further sets the Xdirect apart from other "Active DI" boxes are its extended features and versatility. We have added a switchable low pass Filter that cuts out all very high frequency interference. This Bessel filter on the input is placed out of the audio range and is primarily intended to reduce radio frequency interference before it gets into the main system. The filter is also very effective in reducing any digital computer noise artifacts when using the Xdirect as an interface between a computer based audio workstation and your monitors. A Phase Invert switch, while not normally included with your run of the mill D.I. box, has been added to allow you to switch signal polarity right at the source. This feature is especially handy when you are combining a direct tap with a microphone feed in the mix. The Xdirects active circuitry is powered by an internal 9volt battery when external power is not available. In this mode, it draws 3.5 ma which should give you more than 250 hours of operation off of a new battery. If phantom power is available, then the Xdirect will automatically draw its power from the external source. The Battery on/off switch lights dim when the unit is running off of the battery, lights brightly when it is running off of phantom power and is off when the unit is inactive. The compact black anodized all aluminum case and its flexible power design allow the Xdirect to provide years of trouble free service in Live Sound, Permanent/Fixed Install, D.J., and virtually any PA application. 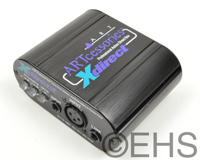 Its full feature set, rugged construction, and high-end specifications make the Xdirect the obvious choice whenever you have to interface high impedance sources with a low noise balanced system.